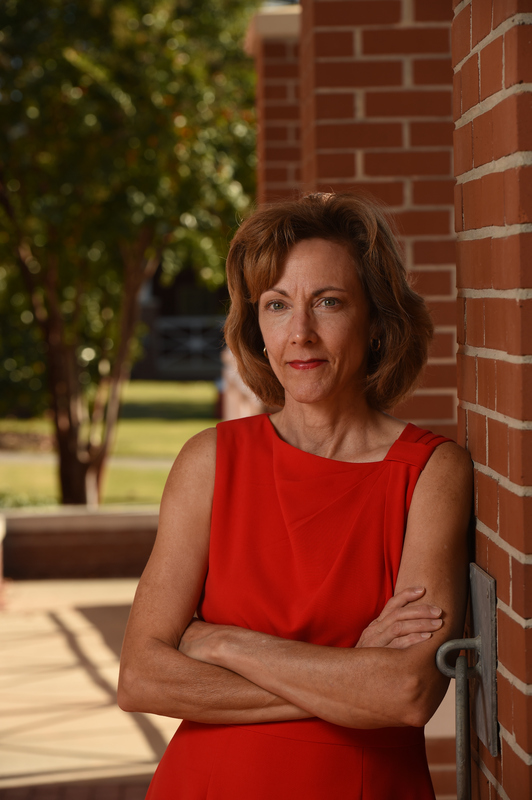 Dr. Pat Rynders, University Veterinarian and director of the Division of Laboratory Animal Health, has been named the Emily Reaves Leischuck Endowed Distinguished Professor in Companion Animal Shelter Medicine at the College of Veterinary Medicine. “Beyond her clinical skills and knowledge, Dr. Rynders provides consistent and effective administrative leadership necessary to support a remarkably diverse program of research involving animals of all kinds across the entirety of the AU campus and throughout the state. She is a problem solver, and for that, she is very much appreciated by all who depend upon our animal care programs,” remarked Dr. Frank Bartol, associate dean for Research and Graduate Studies. “The College of Veterinary Medicine is deeply grateful for the support provided by Dr. Gerald Leischuck in establishing the Emily Reaves Leischuck Endowed Distinguished Professorship,” Johnson said. “The Leischuck family has trusted our hospital in the treatment of their beloved cats, Kitty and Tiger, which are memorialized on the Teaching Hospital’s Tree of Life. As the University Veterinarian, Dr. Rynders provides institutional-level guidance and oversight which is consistent with federal, state and local laws and regulations related to university veterinary care, animal facilities and animal welfare for Auburn University’s Animal Care and Use Program, and provides leadership for AAALAC accreditation for relevant colleges. As the director of the Division of Laboratory Animal Health, she is responsible for supervision, coordination and oversight of that division within the College of Veterinary Medicine. She serves as an adjunct associate professor in the Department of Clinical Sciences. the college and the shelter. She served as president from 2007-11. She has facilitated a strong working relationship between the Lee County Humane Society, the Glyde Memorial Shelter and the College of Veterinary Medicine, working to develop and sustain academic courses designed to both benefit shelter animals and to provide shelter based educational opportunities for veterinary students. 1974, spanned more than 20 years, first as Panhellenic Advisor in the Office of the Dean of Women, and for 13 years as Assistant to the President and Board of Trustees, with primary responsibility for planning, organizing and executing a wide variety of commemorative, ceremonial and social events. She passed away in 2013. Her life was characterized by a warm, graceful and humane outward-directed personality that endeared her to those around her. These traits and her work were recognized formally in 1996 when she was presented the Algernon Sydney Sullivan Award for her “continuing expression of those high qualities which ennoble and beautify living and bind man to man in mutual love and helpfulness.” Her service to Auburn University and the broader community was more visibly commemorated in 1998 when Emily Reaves Leischuck Hall, a residence hall for women, was dedicated in her honor. She devoted considerable time and energy to numerous community and professional interests, including the Lee County Humane Society. 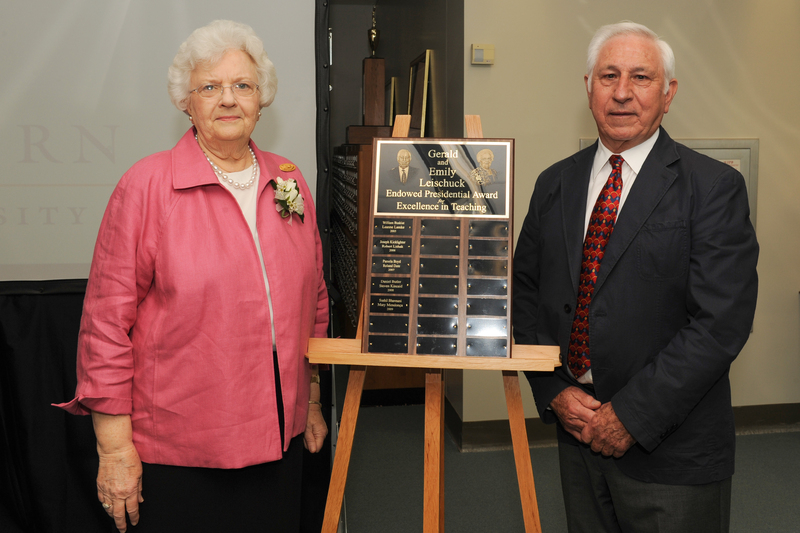 In 2005, the couple endowed the Gerald and Emily Leischuck Endowed Presidential Awards for Excellence in Teaching to recognize and reward the university’s best teachers. The annual awards recognize faculty members who have demonstrated effective and innovative teaching methods and a continuing commitment to student success through advising and mentoring inside and outside the classroom. The 2016 recipient of this award was CVM faculty member, Dr. Elaine Coleman. In 2009, they endowed the Emily R. and Gerald S. Leischuck Endowed Professorship for Educational Leadership, which enables the College of Education to recruit and retain educational leadership faculty.